Spring-cleaning my blog has yielded a few posts that should be bumped back toward the front of the blog. Here’s a good one for this time of year, preventing/treating damp-off disease. 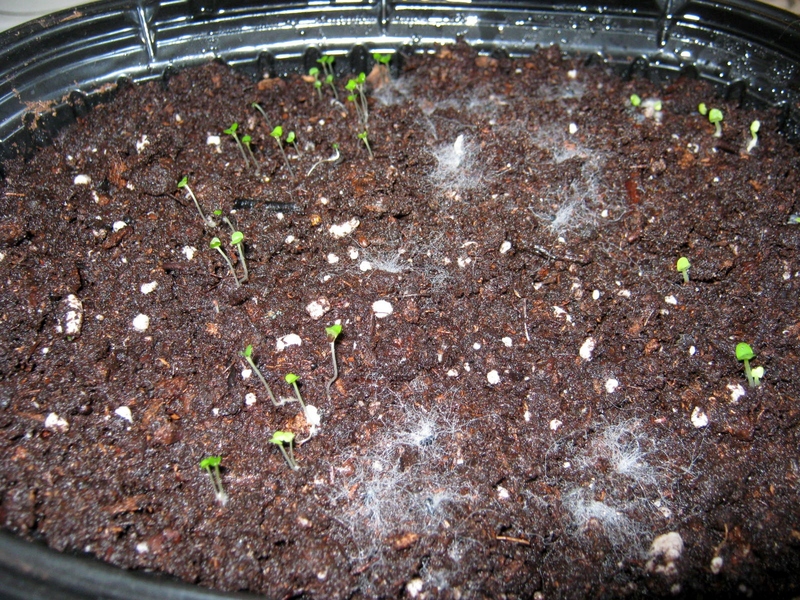 The fluffy white substance on the surface of the potting soil is a seed sprouter’s nightmare. Damping Off is lethal to newly sprouted seedlings. Since I am trying to be as organic as possible this year, I wanted a remedy that would not break my resolve so early in the season. I searched the web and found some odd fixes: lemon jello, ground up moss sprinkled on soil, cinnamon & sand. There were also two remedies I decided were the most logical for me to use. One idea was weak mixture of hydrogen peroxide and water, and the other was a weak solution of chamomile tea. I opted for the chamomile tea. I went to my local grocery store and picked up a box of tea with ingredients of chamomile alone. There were many other mixes, some with lemon, which probably would also work, but I was taking no chances. When I arrived home I boiled water, steeped one bag in two cups, and let it cool down. I used an old hair spray bottle to treat the affected area. These bottles produce small droplets. A bottle with a heavier spray might beat the small seedlings into the soil, killing them even quicker than the damp-off disease. Twelve hours later there is no sign of the damp off disease on the soil. To read more check out this forum on Gardenweb. Gardenweb Damping-Off Forum Responses. Coleus update: Almost all of my initial coleus plantings have four leaves. It’s time to begin potting them up into individual cups. I use Solo brand 3 oz cups. 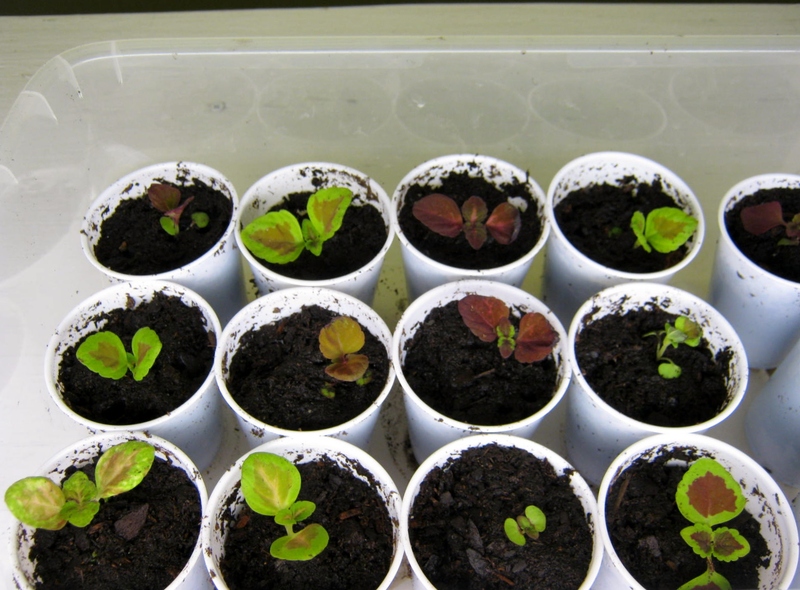 the seedlings are potted up in Miracle Gro organic potting soil as the growing medium. The coleus are already beginning to show amazing colors. This time of year is very exciting as I watch my sprouts and seedlings develop. Glad to see your blog spring cleaning going on so well . I must confess I’ve never read this post before so for me this was a Godsend. Wishing you a happy Easter- to you and your family. May this year bring new beginnings and new resolutions.